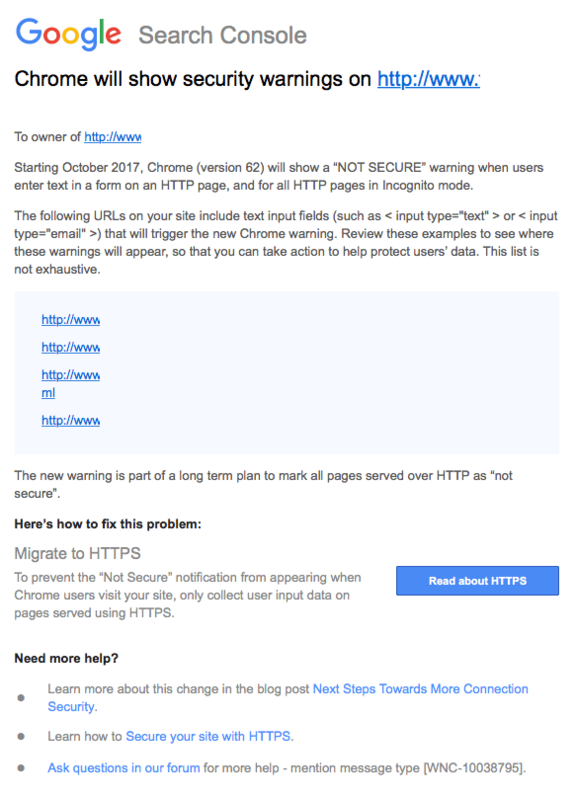 In October Google will release the next version of Chrome (version 62), which will show any site without SSL security (HTTPS) with a security warning as "NOT SECURE". I Don't Have an Ecommerce Site...Why Do I Need a Secured Site? Google will start ratcheting up the ugly non-secure warnings geared to scare anyone using the most recent version of the Chrome browser. Your site visitors will clearly see that your page is "Not Secure." Those ugly warnings are a strong incentive to make the move because any business needs to instill trust with their customers and if they're seeing security warnings the minute they hit your site that's a problem that can and will impact your bottom line. Migrating your site from HTTP to HTTPS is also a ranking factor, although not a strong one. It's considered a "tie-breaker". When all things are equal between you and a competitor, the site with HTTPS wins and gets the top spot. While this hasn't been important enough in the past to add the security, now, Google has made it a critical upgrade for your site. So do whatever you have to do, but get it done as soon as possible. When switching your site to HTTPS, there are several steps we follow for a seamless transition. How Long Does it Take to Complete the HTTPS Migration? Company Name and Address you want registered on the SSL Certificate. Hosting/server login, so we can install the SSL Certificate on your server.